While I know Civ 5 and Gal Civ 3 really cant be compared in all game play aspects, one feature I think Gal Civ 3 would benefit from is similar feature to how Civ 5s Brave New World added International Projects, where civilizations in a game are given the chance to all contribute to the same global project effort for benefits. As it is now only the UP chair really benefits or controls the United Planets as they get to choice the proposals. And unless you have a lower player count or high influence you have no real chance to affect change though the UP giving a less then engaging experience. The project names and effects can be changed but to easier explain things I will call my suggestions the Galactic Projects and Galactic Competitions. These start to become available once the United Planets has begun and a chair has been named. These are triggered similar to Mega Events, they are rare once per game events. These events give the opportunity for all races to participate regardless if they are in the UP and regardless if they are strong or weak in influence. Allowing them to use their other stronger skills such as Manufacturing, Research or Credit Income as a resource to complete the task. As with International Projects in civ 5, civs can begin working on Galactic Projects when the event triggers by selecting said project in the production menu in any of their planets. The ability to build it will last until the project is completed. There are three types of prizes that you can get from your contribution to each of these projects, based on the number of the required resource you contributed to the project. Depending on the project event this could require you to use Social Manufacturing, Military Manufacturing, Research, Influence or Credit Income per turn. The first two, ThirdPlace Bronze and SecondPlace Silver, simply require you to contribute a set amount of the Event Resource, while the last one, FirstPlace Gold, requires you to have contributed the most to the project. By giving everyone a more equal footing to participate as well as still gaining a benefit even if you dont win first place makes the whole experience more engaging and gives hard choices on if they can afford to participate. Example being if your In a war or maybe about to start one, you might change your plans to join the project. Or take the opportunity to build up your fleets while your enemies are otherwise distracted by the event. * +60 Benevolent, +1 Planet [Akia], +1 diplomatic bonus to all other Minor Civilisations. All Akilians ships, star bases and asteroid mines are scraped. * +60 Pragmatic, High diplomacy bonus and Alliance Treaty with the Akilians, +3 Bonus Trade Routes, +25% to all Trade Routes income. +10% Global income. * +60 Malevolent , +1 Planet [Akia], Control all the Akilians ships, star bases and asteroid mines. Instant bonus research points based on the total research put into the project by all races. +15% to Global Birth Rate, if synthetic +15% to soldiering. Unlike Civ 5 however the benefits might also be a hindrance to other races and they also give you Ideology Choice if you are the winner which since it can effect others is the most desirable goal to aim for. 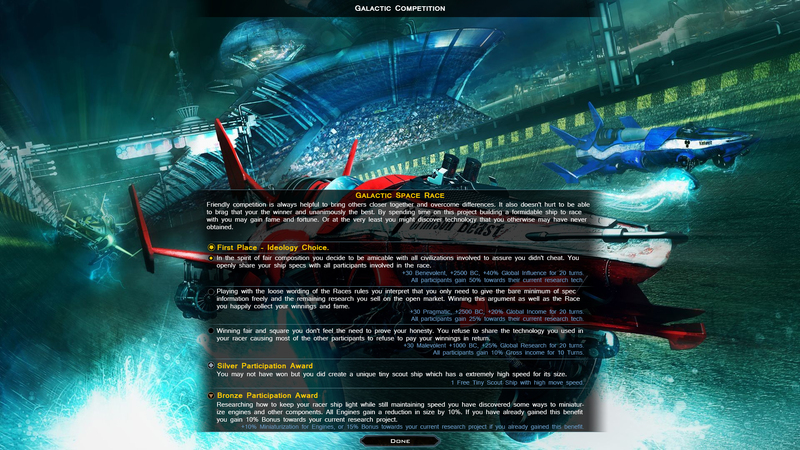 Galactic Competition function on a gameplay level the same as Galactic Projects. With Gold, Silver and Bronze tier goals. The difference being Galactic Competitions are voted on in the UP and if successful the event begins. While the rewards are minor compared to Galactic Projects they can be voted on again and again in order to re-hold the Competition at a later date to be able to get the same benefits. * +30 Benevolent, +2500 BC, +40% Global Influence for 20 turns. All participants gain 50% towards their current research tech. * +30 Pragmatic, +2500 BC, +20% Global Income for 20 turns. All participants gain 25% towards their current research tech. * +30 Malevolent +1000 BC, +25% Global Research for 20 turns. 1 Free Tiny Scout Ship with high move speed. +10% Miniaturization for Engines, or 15% Bonus towards your current research project if you already gained this benefit. I have alot more ideas for events but they seem superfluous as I really only wanted to give the basic idea of how the events function. As I said the rewards and names are just examples and not balanced. I feel like these ideas would enhance how the United Planets function as it will give a greater chance for participation by all races as well as give the potential to change the dynamics of the universe at any given time keeping mid to late game play fresh and engaging. Since I didn't think anyone was going to read these I didn't include some other example ideas that I came up with when brainstorming the events. I got a little carried away to be honest lol. On reflection of how events work currently it never feels like you have earned the bonuses, you just get them. If I was any good at modding I might have added them myself lol. As you see you could also get some nice unique one per galaxy improvements as well as a few other goodies. I didnt bother adding the info related to the Silver and Bronze tier Awards and I figure thematically those plus any Ideology Choices can be worked out later. 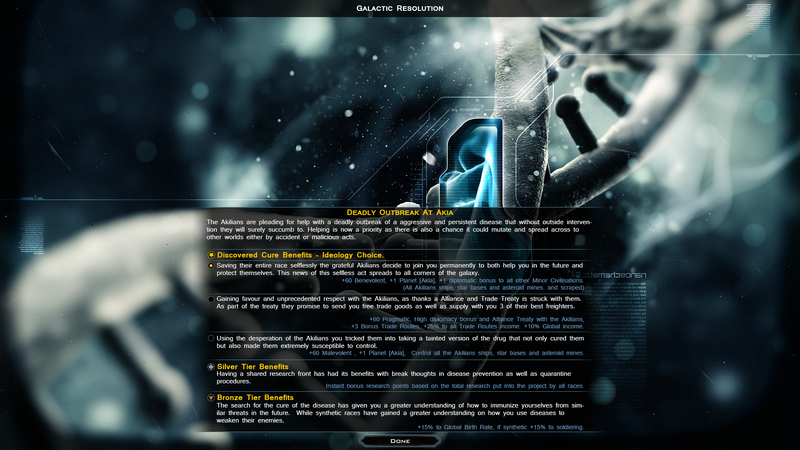 Galactic Resolution Projects other examples. After the recent tax evasion and questionable business practices scandal of a Galactic Tech Consortium it has come on the market to be sold at Auction. The Winner will gain a unique One Per Galaxy Consortium Head-Quaters building which gives Trade and Economic Bonuses. A distress signal has been picked up by all across the galaxy from a Ancient Precursor AI endlessly drifting though space. For some reason the single can not be pinpointed and so cooperation efforts will allow is to save the AI and benefit us all... or ourselves if we get their first. Gain a unique One Per Galaxy AI Core building which boosts research around it and on the planet. A Benevolent option might also give approval as it dedicates its existence to bring joy to others. While a Pragmatic choice might give bonus income, while a Malevolent option could be used to boost our ground war strategy efforts or enhance or defence systems. While the scourge of the universe they are still beings that are demanding rights and better treatment. If Malevolent you can give them refuge and become ignored by all pirates. Or you can give them basic rights and pirates wont attack anyone for X turns while giving all Freighters, colony and constructor ships a bonus +2 to all shields and weapon types when fighting pirates. Alot of interesting options could come from this. The ever changing and evolving galaxies population arnt happen with how the current United Planets has been conducted, let the new election begin. The winner of gaining the peoples votes resets the United Chair timer and you become the new Galactic chair until the next vote may push you out. I like the idea that it can give power to anyone without relying on other races votes, even if just for a short time. Unstable wormholes have begun to open up all across the galaxy connecting to a different distance uncharted galaxy. Whatever reason for them opening is unknown but we must build as many wormhole research mission ships as we can until they close. Basically while the event is on, static "worm holes" spawn and you keep building a unique Research Mission ships to contribute to points to the project once they travel to them. Be fun to either safe guard these ships or attack others if you need to and gives the mission ships another cool use. You gain the usual research you get from doing a research mission, however you also might gain other permanent global research bonuses, rare resources or similar if you spend the resource to do so. Even a hostile Alien ship or two might decide to come though from their galaxy and attack. With the ever growing influx of rare and exotic food stuffs a competition is to be held to crate true artistic food creations. We need not spare any expenses. You gain a bonus to Food, influence and Tourism for X turns. Synthetic gain Credits and Influence and Tourism for X turns. Fads come and go, but who will make the next must have item. Bonus to Trade income and approval for 20 turns. Or if synthetic you gain Trade income and influence resistance for 20 turns, maybe from adding programmed propaganda into every toy! A event is held looking for the brightest or most talent people in the galaxy. Winnings could gain a Citizen of their choice even if they dont have the tech for the type of citizen. And of course other similar bonuses to the lower tiers. Whos home world will hold the conference of the brightest minds of the known universe. Winner gains alot of free research either by honest contribution or espionage means at the conference. Maybe gain a free Scientist, Engineer or Spy. Others gain a bonus to research for X Turns. These are just copied from Gal Civ 2 but can have some fun outcomes. As the overall population of the galaxy grows, the rate of crime expands with it. Local holding facilities are reaching overflow, which is why the idea of a Galactic Prison is being voted on today. Criminals from all races will be sent to a single planet, where security can be focused and criminals will be used as workers to fuel commerce. This would increase local production by 50% for X turns. All options might also effect approval, Benevolent options might give less production but other benefits, while Malevolent can just use them as slaves. In a galaxy filled with different kinds of beings, it can be a challenge to get our civilians to see eye-to-eye. While many ideas have been brought to the table, the most obvious way to bring our people together is through a Galactic Olympiad. Next year, all attending races will come together to compete in different events. income and tourism for a planet makes the most sense for a reward. You could even make the rewards instead based oh how well your people have preformed based on food gain or something. FWIW, it has been stated that the next big update/DLC will have an emphasis on politics/diplomacy, so your suggests are well-timed..
GCII had the plague and then the ability to research the cure. Nothing like that exists in the current game, and that could be a huge one..
Their are alot of cool events from GCII and that could easily be adapted and expanded upon. I cant wait to see what things we might get from the diplomacy update. Will really bring the universe alive! One thing im really happy about from the latest patches is the more abundance of nebulars causing interesting strategic positions on the map. Maybe I have just been lucky who knows. But with rifts as well it could really add another dimension, if they decide to go that route.